Sunwing has launched its 2017/18 cruise brochure, offering fly/cruise packages departing from Toronto, Montreal, Quebec City, Ottawa, Winnipeg and Halifax. Cruise packages, which include airport/port transfers, are available with MSC Cruises, Norwegian Cruise Line and TUI Discovery 2. 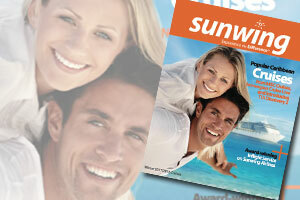 New to Sunwing this season is TUI Discovery 2. Departing from Montego Bay starting in November, cruises on this ship include daily gratuities and features an all-inclusive beverage package, unique itineraries, and such amenities as a rock climbing wall, mini-golf and indoor pool. Also featured in the brochure is Norwegian Epic, which sails from Port Canaveral and includes seven-night cruise and one-night hotel stay in Orlando. ‹ FlyEx.com: Is this retail travel’s Airbnb?